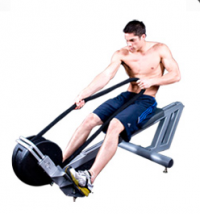 The compact and versatile IBEX™ offers unparalleled workout variety! Use in horizontal and vertical configurations for a complete total body workout. Get the edge on your competition with self-adjusting Intelligent Resistance™ for improvement in almost any sport or activity. The compact design, smooth operation, and maintenance-free engineering give you the peace of mind you need to focus on your training goals. The benefits of climbing rope are no longer the exclusive province of elite athletes with the Oryx™. Now, safe and effective rope-pulling exercise is available to athletes, students, fitness enthusiasts, and even for injury-rehabilitation purposes. No need to worry about the risks and inconvenience of hanging rope from the ceiling. The seat offers added stability and safety, and it is removable for wheelchair-accessibility. 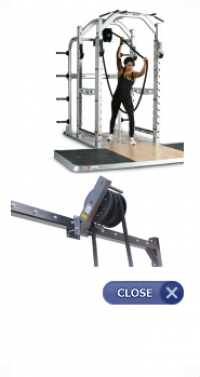 Intelligent Resistance™ adjusts to the needs of users of all fitness levels. Get the added benefit of a moving seat for a twice as effective workout in half the time! 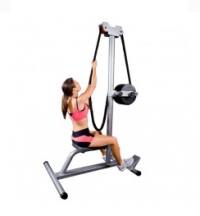 The unique Addax™ seamlessly integrates lower and upper body functional movement to maximize efficiency and fun! Intelligent Resistance™ technology automatically optimizes the difficulty level to adjust to the specific needs of each user, each workout, every time! 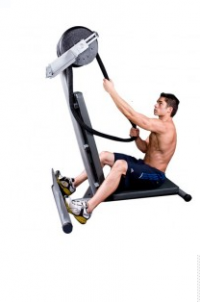 The Addax can be utilized equally effectively for cardiovascular, as well as strength training. Everyone loves the unique design, variety of exercise, and smooth operation of the Addax.